Having a second washbasin in your bathroom can look stylish and elegant if given ample space for maximum effect. 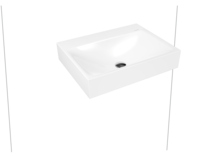 The alternative is a double washbasin by KALDEWEI. In a purist design with two taps, this washbasin exudes a similar elegance, but requires less space.